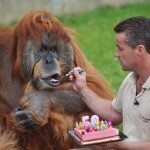 La Boissiere-du-Doree zoo Orangutan Major, who has lived here for more than 20 years, has turned 50 years old on July 17. And to congratulate the birthday boy the whole crowd of visitors has gathered. 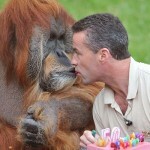 In fact, zoo visitors for a long time attached to this shaggy but very cute monkey. 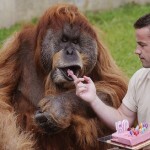 Meanwhile, Zoo director Sebastien Laurent gave Major a delicious cake, and even fed him carefully. Funny, Major, a 125-kilogram (275-pound) father of 16, blew out the candles on a strawberry birthday cake. 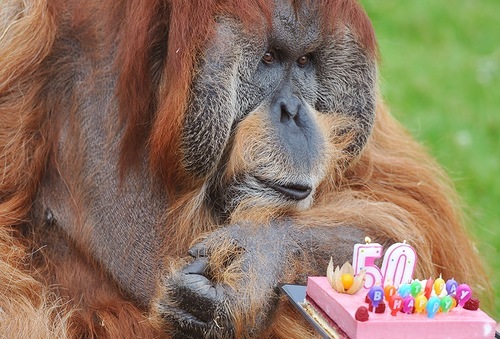 Born in 1962 in Indonesia, captured seven years later, Major lived in zoos in Germany before transferring to France in 1989. By the way, especially prized for his reproductive prowess, Major lives at the zoo with his three female companions and four children.